Entertainment Weekly continues to release images from its Comic-Con 2014 issue. Today, we get a new look at Mad Max: Fury Road. 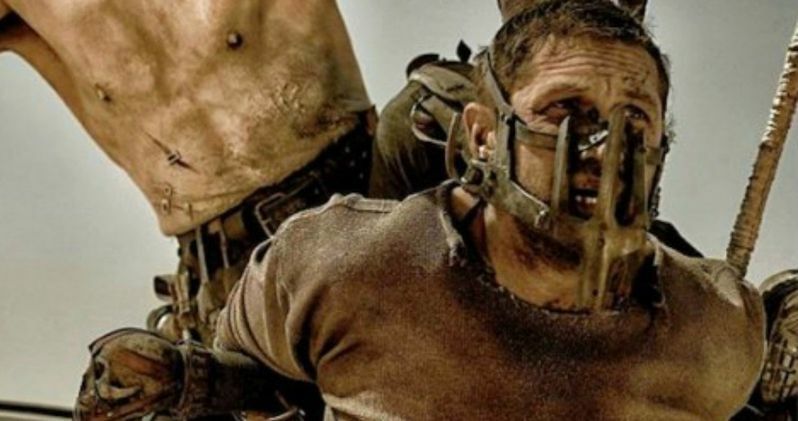 The first photo finds Tom Hardy as Max Rockatansky muzzled and strapped to the hood of a fast moving vehicle, as Josh Helman rides above him decked out in war paint. We also get another look at Charlize Theron as Imperator Furiosa standing next to a deadly looking armored Semi-Truck filled with mutants from the apocalyptic wasteland. Mad Max: Fury Road is a sequel that also serves as a partial reboot, with Tom Hardy taking over the role of Mad Max from Mel Gibson. Max is still dealing with the tragic loss of his wife, events that were depicted in the original Mad Max from 1980. He teams up with Charlize Theron's Furiosa, who is attempting a long journey back to her childhood home. Along the way, she is being chased by Immortan Joe (Hugh Keays-Byrne, who starred as Toecutter in the first film). Mad Max: Fury Road will be a part of the Warner Bros. panel at Comic-Con 2014 on Saturday, July 26th. We can expect the first footage, and perhaps even a trailer.